Calcareous rocky slopes and woodlands. Forest edges, bottom of steep slopes. 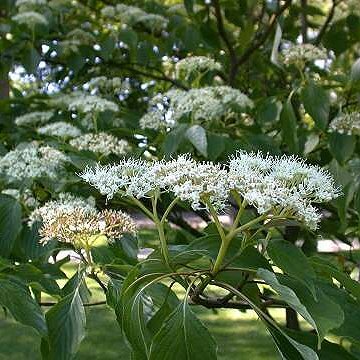 This list is an amalgamation of various associates found over a broad range of habitats: Acer pennsylvanicum, Acer saccharum, Acer spicatum, Amelanchier canadensis, Aralia racemosa, Arisaema triphyllum, Corylus americana, Corylus cornuta, Cornus rotundifolia, Fraxinus americana, Kalmia latifolia, Lindera benzoin, Parthenocissus quinquefolia, Prunus serotina, Prunus virginiana, Sanguinaria canadensis, Smilacina racemosa. Newfoundland and Nova Scotia west to MN, south to FL, AL, and AR. Shrub or small tree to 6 m; twigs often reddish on new growth; pith white; buds red-purple; bark smooth, thin, reddish-gray. Leaves alternate, crowded at ends of twigs appearing opposite or whorled, ovate, acuminate, simple, entire, deep green above, lighter beneath. Flowers small, in flattened upright cymes. Fruit blue-black, berry-like, on red peduncles, ripen mid summer. The specific epithet refers to the fact that this tree has alternate leaves, unlike other members of the genus which have opposite leaves. Sometimes used as an ornamental. Fall color can purple or red. Dirr, Michael A. 1998. Manual of Woody Landscape Plants: Their Identification, Ornamental Characteristics, Culture, Propagation and Uses. 5th ed. Champaign, Illiois: Stipes Publishing L.L.C.